I was strangely fascinated and disgusted with this book all at the same time. It is not for the faint at heart or for those who don’t like swearing. It is incredibly graphic. Jeff describes in full detail the decomposition of dead bodies as well as his train wreck of a life. He details the reasons why he went from a very religious upbringing to having no faith. He lived in a frat house until he was over 26 and tells some tales of frat and sorority life that make me glad I was never involved in that lifestyle. I love T.V. shows like C.S.I. and Dexter so it wasn’t the gory part of the story that got to me so much as the total disregard for people who are mourning a loved ones loss. Jeff chronicles his start as basically a nice guy who becomes an unfeeling jerk in a job to profit off of other people’s sorrow. 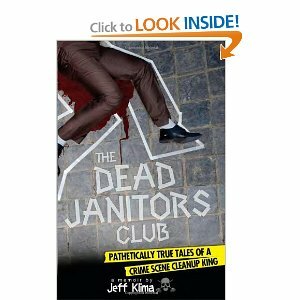 The purpose of the book is to expose the Crime Scene Cleaners way of doing business. He does a great job of that. I sincerely hope that I never have to deal with a company that does business the way they ran theirs. In the end I think Jeff achieved his goal of outing the industry but if I were going to tell someone to read it, I would have to know them really well and know that they wouldn’t be offended by it.